Now you've got an opportunity to restore VMware VMFS disks. VMFS Recovery software provides a number of thorough recovery procedures that you can rely on. It recovers your data stored on VMware disks created with VMFS file systems. 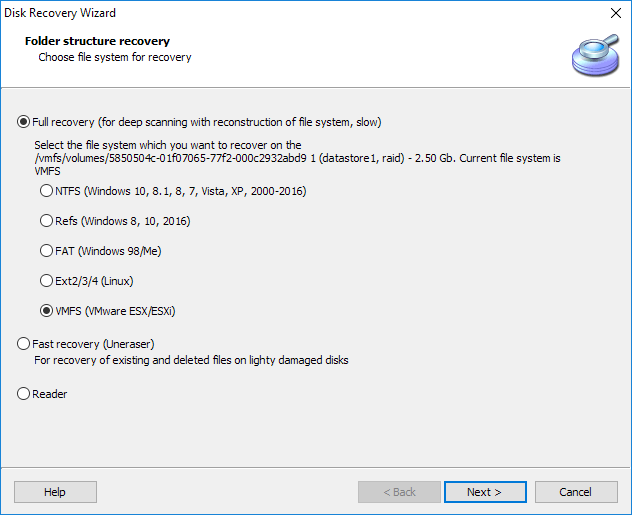 VMFS Recovery is really an indispensable and the most powerful tool for anyone using virtual machines and disks, including VMware, VirtualPC, VirtualBox, Parallels, EnCase, ProDiscover disk images. Among other benefits it features vSphere 6.5 and ESX Server support. Different reasons can lead to a VMFS failure. Two widespread ones are: damaged blocks and corrupted RAID arrays. Some cases can get very complicated! For example, a relatively big cluster of multiple virtual PCs is controlled by Vmware ESX Server and is stored on a RAID array. Suddenly either a RAID Controller or a RAID array fails. VMFS Recovery provides a corrupted RAID array reconstruction even if a dedicated RAID controller is damaged or inaccessible. With the JBOD, RAID 0, 1, 1E, RAID4, RAID5, RAID5R, 0+1 and 1+0 support VMFS Recovery will restore virtual PC images from safe and corrupted hard drives and RAID arrays. VMFS Recovery supports VMFS partitions up to 64 TB, files up to 2TB, VMFS6 and VMFS5 drives with more than 100,00 files on them. You can choose one of two modes depending on the task. Fast mode is recommended for existing or deleted files recovery, when a disk is safe or slightly corrupted. Full mode helps to recover your data when a situation is far more complex. You can recover virtual PC's images from ESX servers. In this case VMFS Recovery performs a two-stage procedure. During the first stage a damaged ESX/ESXi storage is recovered, as soon as it's done and VMFS Recovery has an access to separate virtual machines and their VDMK disks, a number of necessary recovery procedures is performed successfully. Recent Changes: New registration keys, x64 support, Completely new Uneraser mode, more then twice speed up, VHDX support, improved Raid recovery.